Children under the age of one or so are the perfect age for showcasing fantastic shoes. I’m not talking sneakers or hiking boots, I’m talking arty, cute-to-boot, non-walking kind of shoes. One look at these gems from LaLa Shoes and you will get my drift. LaLa Shoes are more than just a shoe. They’re mini pieces of art lovingly created for tiny feet by the extremely talented Daria Ausenak. There’s a bounty of brightly coloured wool felt creations to be discovered, all sitting alongside the most gorgeous and serene linen varieties. Each pair begs to be noticed when worn by your smallest person, and they will be! The easy linen ballet style of Little Pinks (pictured above) is perhaps my favourite, followed closely by LaLa Autumn (pictured below left) because I never have enough will power to resist a pink and green combination. 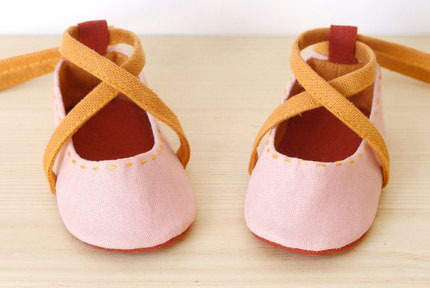 LaLa shoes have sizes to suit both babies from three months and small toddlers up to two years. Styles and sizes specifically for babies will have a thick felt sole while those for older babies and walkers have an eco leather outer sole fitted. See the beautiful and extensive range on offer at LaLa Shoes, prices start from US$42 with an additional US$7 charge for shipping to Australia. We have featured these delightful shoes in the past but the stunning new range is certainly worth another mention.